After missing round one, Abbey Holmes can’t wait to play for the Crows against Melbourne on Saturday. Star forward from the Northern Territory Football League who can also rotate through the midfield. Topped the NTFL’s goalkicking tally four times and in 2014 became the first woman to boot 100 majors in a season. A lifelong Crows fan and originally from South Australia, Holmes joined Adelaide with pick No.103 in the inaugural AFL Women’s Draft. Athletic, skillful and a strong mark overhead or on the lead. Emerged as an important contributor in the Club’s inaugural AFL Women’s season. Holmes played every game, leading the Club for handballs (38) and finishing top five in score assists, contested possessions, contested marks and hard-ball gets. 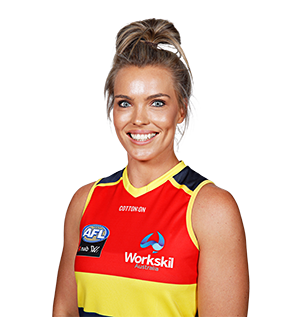 Her mix of skill and toughness was on display in Adelaide’s comeback victory over the Dockers in Round Four at Fremantle Oval, where Holmes had a season-high 15 possessions, laid three tackles and kicked a goal.